Your employees are key assets that drive your business’ success. So, making your organisation attractive to top-level talent should rate high on your priority list. 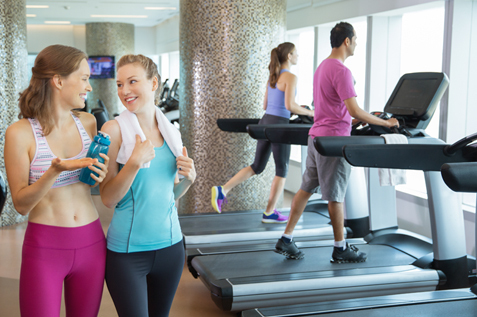 Creating a fitness-oriented company culture your staffers can resonate with is a huge step-up. So, make sure to devise a good workplace wellness program. It will not only help you save on medical costs, it will also make your employees feel they’re in good hands. Below is a list of healthy office equipment that will help make your team healthier and happier. A surefire way to boost your employee wellness and fuel their work performance in the long run. What does your team munch on during work hours? Chocolate bars, chips, soda and other sodium and sugar-packed items? Most probably. Sceptical about changing their eating habits? Shove good things under their nose and you’ll be surprised! Having healthier foods within arm’s reach will help you reduce sick leave and boost productivity. So, fuel your workforce with some real power food! Some nutrient-packed organic products, low-sugar variants, and gluten-free items. 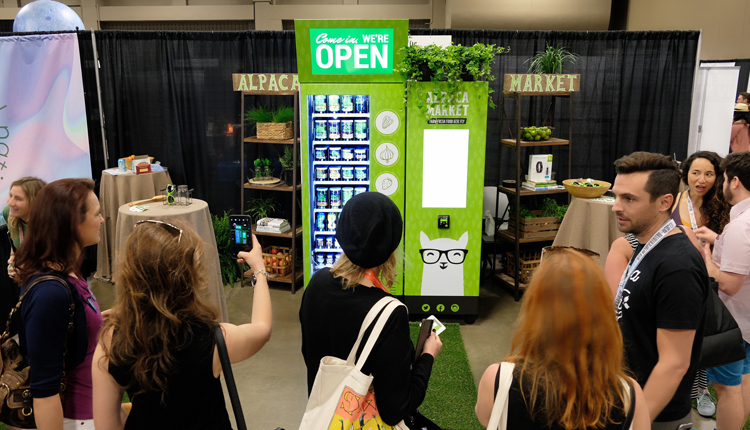 All Real Food offers vending machines packed with healthy drinks, fresh mason jar salads and organic vegetarian wraps. It’s healthy, affordable food with traceable, locally sourced ingredients. 2. Big Fridge for Big Changes! Small changes can make a big difference but a big fridge can bring big changes for your employees health. Especially if you give them a little push by adopting a bring-your-own-food-to-work policy. Even if just a fraction of your staff are health-conscious, you should encourage home-prepared lunches over any other food choice at work. Having an office refrigerator allows your employees to do exactly that! They can conveniently store their home-prepared lunch and healthy snacks. Instead of slipping out for another calorie bomb takeaway, your staff can enjoy a home a cooked feast that can be heated up in a jiffy. It’s a brilliant way to save money. Plus they’ll get some bonus time to stretch their legs or have a leisurely hang-out in the nearby park. Specifying some rules won’t hurt. 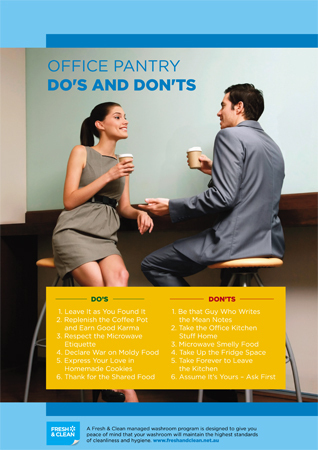 So, post this poster in your pantry’s fridge to remind your team of your office pantry do’s and don’ts. You can also draw inspiration from mindbodygreen that’s placed wellness as its company core value. Their fridge is packed with complimentary coconut water, organic coffee and biodynamic wine. A recent study shows that standing on the job is twice as bad as sitting for your heart. This doesn’t mean that sitting can be dismissed as one of the key triggers of the 21st-century health epidemic. It only means we should take prolonged standing just as seriously. Professionals like cooks, baristas and machine operators are at an increased risk. But as far as this matter goes, your hands as an employer are far from being tied. You can throw in some amazing ergonomic mats to improve the health and comfort of your workplace. This will have a direct impact on your employees’ health, satisfaction and performance. 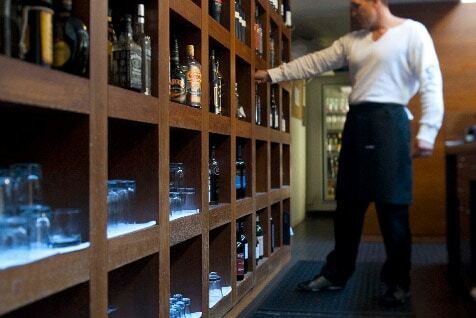 Alsco has amazing anti-fatigue mats that are ideal for jobs that require prolonged periods of standing. They’re easy on your spine, knees and feet. They’re also good support for better posture. Or pair an anti-fatigue mat with your height adjustable office standing desks. Is a match made in heaven! Setting up an office gym can cost an arm and a leg. And although having an office gym is a ubiquitous corporate hype, let’s face it, many businesses can’t afford it. Yet you don’t have to think big when planning for your office workout nook. All you need is a well-ventilated space and a bit of equipment. Home Fitness Guru‘s two cents are to gear your small gym with an exercise bike, a treadmill and a rowing machine. A home gym system is great too, as it doesn’t take up a lot of space and provides a variety of useful exercises. And remember, your office gym plan won’t work out without installing on-site showers and lockers too. And without spotless washroom hygiene. The reasons are more than tangible. Want to lighten your office atmosphere and get your team moving? The easiest and most affordable way to do it is to install a ping pong table. Table tennis is far from being just a fun pastime. Neuroscience suggests it can improve motor skills, attention and memory. Having equipment at their fingertips is the best way to engage your team in some physical activity. It’ll loosen up their bodies and sharpen up their minds. 6. Pilates Ball Chairs? Why not! Using a Pilates ball instead of your office chair can bring striking benefits to your core muscles, legs and spine. When sitting on an exercise ball, what you’re actually doing is some isometric exercise. Without even being aware of it! Do yourself a favour and get one! You don’t have to leave your office to get some proper team building. Bring some real fun in without too much fuss. 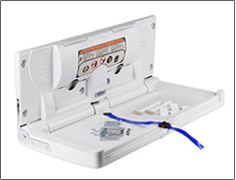 All you need to do is install a Wii console! Then organise some Wii sports and dance tournaments. It’ll get your team up and moving. Plus, it’s loads of fun! We bet they’ll be pressing you to bring it on again. Perking up your office with equipment such as these will get your team involved in office activities in a blink of an eye. It’s a stellar way to improve employee wellness, have fun and achieve better work performance. For more ingenious, offbeat ideas from wellness experts, check out Alsco’s massive list of employee wellness ideas. And let us take care of your office hygiene the pro way. Streamlining your practices through outsourcing hygiene services is a very smart idea! Our unrivalled cleaning services will keep your employees healthy and safe while engaging in fun on-site activities. 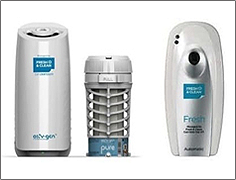 Washroom services, hand hygiene, odour control? Washroom maintenance and washroom equipment rental with regular refills. Wall-mounted air fresheners with wide variety of scents available. Replenished often. 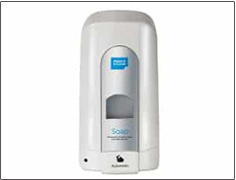 Everything a workplace washroom needs to ensure perfect hand hygiene. Count on us! We’ve been around for more than 50 years and have 48,000 customers to back us up. Give us a call now, and we’ll sort all things hygiene for you.